White tea will always have a special place in my memory. Imagine my surprise when I pulled the tea bag out of the box to find it was shaped like a pyramid! Not to mention that it tasted sublime. With its lightly sweet, delicate profile, white tea is the perfect compliment to many fruit flavors. White tea, like green, black, and oolong, is made from the Camellia sinensis plant. Similar to green tea, white tea is heated (calling Firing or Kill-Green) to break down the enzymes that would cause oxidation before it can take place. Two important differences define white tea. The first flush of leaves are harvested before they open fully, when the young buds are still covered by fine white hair – hence the name. Then, before the leaves are dried to prevent oxidation, they are allowed to wilt. Therefore, white tea is slightly more processed than green (which rids it of the grassy undertones), but the youth of its buds makes it even more delicate (and rare). White tea also requires the lowest temperature for proper brewing. To brew the perfect cup of white tea, steep the bag or loose leaf in water no hotter than 160 degrees. The boiling point for water at sea level is 212 degrees, so let your tea kettle sit for seven to ten minutes after it screams. 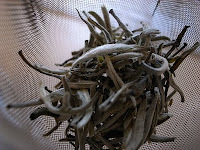 Unique to white tea, however, many connoisseurs will allow the leaves to steep for up to 15 minutes. Water too hot will turn the tea bitter, but longer steeping times at these very low temperatures allow the complex notes and flavors to more fully develop. 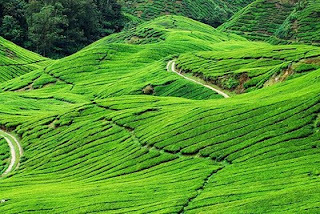 The origin of tea can be traced back to over 4000 years ago in China. No one is sure where and when tea was first brewed; stories about tea’s origins are more myth than reality. One story tells that a legendary Chinese leader and medical expert, Sheng Nong, discovered tea as a medicinal herb in 2737 B.C. One day while he was boiling water under a tea tree, some tealeaves fell into Sheng’s pot of boiling water. After drinking some tea, he discovered its miraculous powers and immediately placed tea on his list of medicinal herbs. Initially used as an offering and as medicine, tea became the most commonly used beverage during western Han dynasty. Buddhist monks started growing it around monasteries…a Buddhist monk introduced tea to Japan in the 6th Century and later in the 16th Century a Portuguese missionary introduced it to Europe. There began the history of Tea as an international drink. While the majority of white tea comes from China, other sources include Japan, Sri Lanka, India, and Africa. With the youth of its buds and leaves, white tea contains even more catechins (antioxidants widely believed to improve general health), gallic acid, and theobromine than green tea. A study at Pace University in 2004 also showed that white tea had more anti-viral and anti-bacterial qualities than green tea. It is worth noting, however, that while white tea has significantly more powerful antioxidants than black tea, it does not have black tea’s theaflavins (formed during oxidation in cultivation). I thoroughly enjoy white tea and recommend it to everyone. It is very popular as a fruit-and-tea blend here in the west, especially from Lipton – whose peach white tea was my very first white. If you already have a favorite white tea blend or product, leave it here in the comments! Leave your feedback and share this page to keep the discussion going! Here’s a low-cost, five-star-rated tea to start you on your journey. White tea, with its young buds and time spent wilting does not have the grassy flavor of green tea and so pairs great with fruit. Quick tip: Shave some citrus fruit rind into your steeping tea to let the zest infuse your cup with fresh fruity goodness. Unless otherwise sourced, all information comes from Wikipedia and its prodigious list of sources. >Hey, Wade. Great article. You should definitely do kombucha next, although I suppose that's not exactly a variety of tea. More of a beverage made of tea. Personally, I like it, and it can be made at home (you'd have to order the culture online), but I wouldn't recommend it. Culturing kombucha will make your house smell faintly of wet wool socks. Oh, and what about bocha? I like bocha, too. >I've got to finish the C. sinensis teas (black is all that's left), but I'll add kombucha and bocha to the herbal and rooibus teas that I have yet to explore!